As we like simple wholesome food, we thought our aims should be recorded simply! It is the rustic, peasant food throughout the world that uses pulses so widely. These wholesome foods of the home usually underpin the country’s cuisine and consequently are an essential part of the culture and agriculture. In some cases they are the national dish, such as the wonderful Brazilian Feijoada. Inspired by authentic recipes from around the world, our aim is to create: easy to prepare, great tasting and healthy food. Our beans are cooked slowly in one pot with lots of other natural and wholesome ingredients. Cooking in this way keeps all the nutrients in the pot and we take care that our one-pot meal recipes are balanced for a healthy diet. When we select our ingredients they have to taste good and have no hidden nasties – absolutely no artificial colours, flavourings or preservatives. 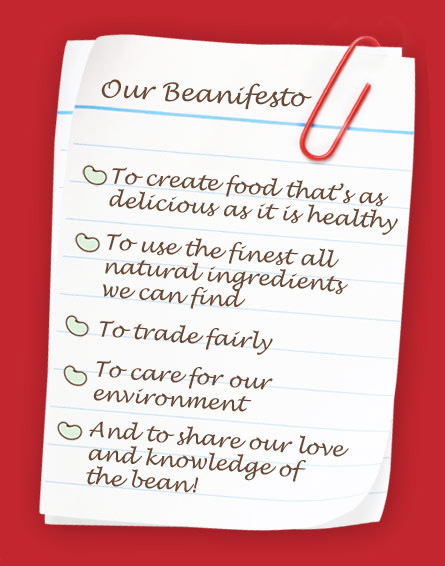 We are proud of what goes into our bean-pots. We know how important it is to use top quality herbs, spices and stocks. We also care about the origin of ingredients, where possible our meat is sourced locally and is free range or Freedom Food Assured. To get that authentic flavour we are prepared to be extravagant: for instance the pimentón in the Spanish Puchero carries the PDO status (protected designation of origin) giving a rich smoky flavour. It’s not in our nature to be skimpy so our recipes come packed with vegetables and pulses. This means one meal pot equals TWO to THREE portions of your five portions of fruit and veg a day! Easy Bean is committed to being a socially responsible business. We recognise that our activities have a direct impact upon the well being of our employees, customers, suppliers and the wider community. Also, through our purchasing practices, our activities impact on communities nationally and globally. We worked with the Fairtrade Foundation to establish Fairtrade accreditation for pulses and subsequently we developed three Fairtrade one-pot meals. This meant we were the first to launch a Fairtrade “chilled ready meal” back in 2011. Now regretfully, the farmer association in Inner Mongolia that supplied us with Fairtrade pulses is no longer a certified producer group. This association was the key supplier of Fairtrade pulses being imported into the UK. Without the Fairtrade pulses in our recipe then we cannot achieve the required percentage to achieve the Fairtrade Mark. It is our hope that we will be able to establish a new supply of Fairtrade pulses in the future. At Easy Bean we are committed to reducing our adverse environmental impact and we will continually strive to improve our green credentials. We spent many months trying to find the most sustainable packaging for our easy beans. Biodegradable would have been good but as yet such packaging doesn’t withstand a hot fill, good seal and then microwaving for reheating the meal pots. However, our polypropylene pots can be recycled or better still reuse as a handy storage container in the kitchen. Our sleeves can be recycled and our leaflets are printed on 100% recycled paper. When we organise tastings we use biodegradable sporks (cross between a fork and a spoon made from corn starch!). We think beans are pretty special. Firstly, they look good: all shapes, sizes and colours – like pebbles on a beach. What’s more they are a key ingredient to so many cuisines around the globe – think cassoulet, feijoada, falafel, dhal – not surprising then that beans and pulses are the second most important food in the world. High in protein, virtually fat free and with more fibre than many wholegrains, beans are one of nature’s healthiest foods! It is our intention to share bean info, photos, stories … more is planned for our website in the future.